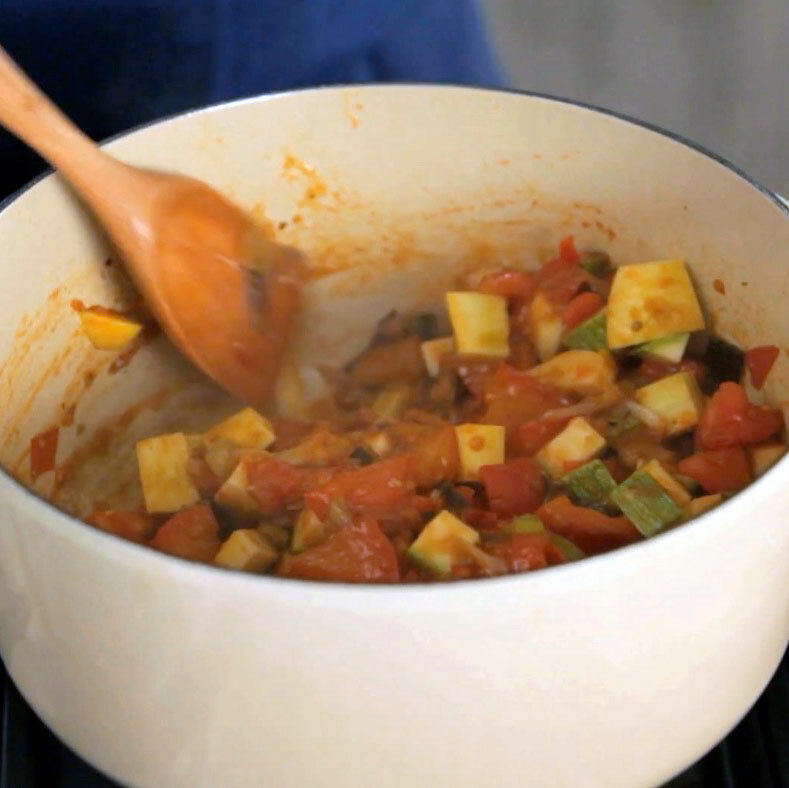 Clean and dice all the vegetables, onions and garlic (remove seeds from eggplants and bell pepper). In a dutch pan or large saucepan “confit” the eggplants in 1/2 cup of olive oil (‘confit' means cook slowly in oil). Eggplants retain a lot of the oil so you need to nourish them well from the start. Once the eggplant starts to moisten add the bell peppers, then a few minutes later the onions, bay leaves, rosemary and garlic, stirring regularly and enjoying the perfumes from the south of France. Bring to boil 1.5 liters of water in a large saucepan. When the water starts to simmer (you don't want big bubbles), break one egg in a small bowl. With a fork, stir the water to create a spiral movement. Add the white vinegar and salt. Pour gently the egg and with a spoon bring together the egg white around the egg yolk. Cook for about 2 minutes. The egg should be soft and the white, cooked. Take out the egg and cool it off quickly in a bowl of cold water. Take the egg out of the water and place it on tray with a paper towel. Salt with a pinch of fleur de sel. Repeat the operation with the other eggs. Review Body: I love Ratatouille, pouched egg is a plus!